There will be no workout at Big Ball (downtown) this Saturday, September 15th. Instead, we will converge with the Asylum for Preacher’s final Q before he leaves for Arizona. As usual, the Asylum work out will be from 7:00-8:00 We look forward to the beatdown and Preacher’s word! Time to give back and have a little fun at the same time. Our April 2nd F (Fellowship) will be held at Abridged Beer Co. Thursday April 12th. $3 for every beverage purchase made by F3 Knoxville will go to The Wesley House, an after school program for inner city youth. So bring friends, come thirsty and enjoy the fellowship. F3 Knoxville is hosting their first Obstacle Course Race to benefit Operation Enduring Warrior. The event is on May 19, 2018. It will involve teams of 2 to 8 people racing 2 team members at a time to complete as many laps as possible on a 2 mile 20 obstacle course. There is a 5 hour and a 10 hour race option as well as a kids fun run to kick things off for the day. 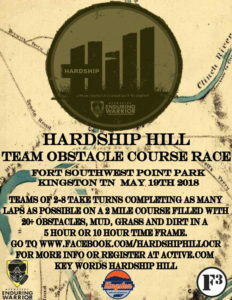 Go to www.facebook.com/hardshiphillocr For more info or register at www.active.com keywords Hardship Hill.